This is what 87 buffalo look like first thing in the morning. Huge herds of Elephants, Buffalo, dazzles of Zebra and hundreds of Impala; Lion, Leopards and Wild Dogs - a game drive in the Chobe National Park can be a fantastic safari experience. Beep Beep... Beeb Beep... my Cell phone alarm is trying to rouse me. Its 05:30 and I wanted to be sure to make the morning game drive. Reception could have phoned but I did not want to disturb my travelling companion that much, but he decided to get up and come on the game drive. On the veranda we munched on a muffin or two and had a cup of coffee. Our guide then collected us and we climbed aboard the open sided cruiser. As we headed out the gate we encountered a herd of Elephants. We'd seen so many of these huge creatures we were blasé momentarily forgetting our earlier wonder, "Oh Elephants ... what's next?" They were quietly eating just off the road and we passed really close. Then we drove on and did not see much for a bit. 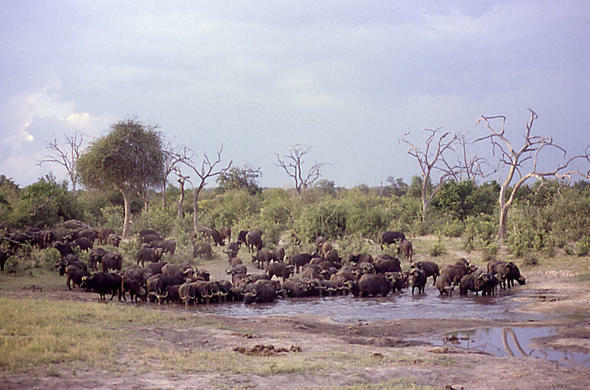 Our guide then took us down along the floodplain.We came across a large herd of Buffalo. Just a bit further on in the tree line there were a couple of Lionesses and two sub-adult Lions next to a Buffalo that they had obviously killed in the night. They were fully and sleepy. We stopped just a few meters away. Literally gazing into the Lionesses golden eyes was a mesmerizing experience. The cubs were interested in these tourists who were gawking at them but eventually got bored and started swatting each other's tails. Then when other vehicles started arriving we moved on. One of the other guides radioed that he had found a Leopard and we went off to his location. The huge cat was stalking off the floodplain after its morning drink. It soon disappeared into the bush. Driving on we came across a group of about twelve Wild Dog puppies.This was a truly exciting sighting. They were guarded by two females who were acting as nannies. They were obviously waiting for the rest of the pack to return from hunting. These Dogs are rare, having been mercilessly hunted in the past. The Moremi Game Reserve is one of the best places in the world to see them. We saw a few herds of graceful Impala down on the floodplain, dazzles of Zebra - a couple even had a dust bath just meters from us. A group of elegant Giraffes were browsing nearby and on our way to catch our flight, a huge herd of about 30 Sable Antelope. This was truly some of the best game viewing that I had ever experienced. The end of the dry season is the best time to see the wildlife as they congregate near the life giving waters of the Chobe River. In the rainy or green season, the animals are more spread out, and might be harder to find. The guides at the lodge are all women - a great empowerment initiative. They are very personable and knowledgeable about the area and its animals. Game drives in conjunction with river cruises afford some of the best wildlife viewing opportunities in Africa.